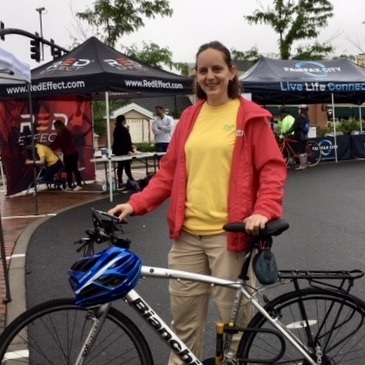 On Bike to Work Day 2018, FABB volunteers were pleased to meet and talk to Chloe Ritter. A regular bike commuter, Chloe lives in the City of Fairfax and rides to her work at Fairfax City Hall. She also likes to ride the Daniels Run Trail and, when she needs to get to the Vienna Metro station, on Old Lee Highway. Chloe calls bicycling a "good way to trick myself into getting exercise." She most enjoys the freedom and convenience that comes with being on a bike. When asked what would make it easier and safer for her to ride, Chloe told us, "Separated bike lanes, and robust education for drivers and bicyclists." Better bicycle education was a common theme across the various pit stops on BTWD 2018. FABB is actively working with the Fairfax County Department of Transportation to support its BikeFairfax program and associated educational efforts. FABB also is stepping up its own educational efforts through bike classes and support to training more certified instructors in the county.